Adults should eat between 2.5 and 3 cups of vegetables a day, depending on caloric needs, according to the MyPlate guidelines from the United States Department of Agriculture. If you plan to cook your veggies, it's useful to know what cooking methods best preserve, or even enhance, their nutritional value. The University of Parma in Italy analyzed boiling, steaming and frying to determine the effects these methods have on phytochemical contents of carrots, zucchini and broccoli. They found steaming and boiling vegetables preserved the most antioxidants. They also found an increase in antioxidant levels in all of these cooked vegetables, concluding that cooking may actually help increase antioxidant levels. They attribute this to cooking's ability to soften the vegetables' fibers and increase antioxidants' availability. Columbia Health, a division of Columbia University, notes that some vitamins, particularly many B vitamins and vitamin C are lost or diminished through cooking vegetables in water because they leach into cooking water. Saving cooking water and using it in soup or elsewhere helps put leached vitamins to good use. They also say the longer the cooking times and the higher the heat, the more of these vitamins are lost, so brief steaming can help preserve some vitamins, along with color and flavor. Kyoto University researchers conducted a study on cooking's influence on mineral content. Their results, published in the "Journal of Nutritional Science and Vitaminology," found many minerals are lost during cooking. Monitoring potassium, sodium, calcium, magnesium, phosphorus, iron, zinc, manganese and copper levels, they found that cooking decreased mineral content by an average of 60 percent to 70 percent. Squeezing the vegetables after boiling incurred the biggest losses. Parching, frying and stewing the vegetables resulted in the fewer losses. Some enzymes and other compounds are destroyed through cooking. For example, an enzyme called myrosinase, found in broccoli, helps rid the liver of carcinogens but is destroyed by heat. Allicin, the compound responsible for garlic and onions' strong taste and smell, is also destroyed by cooking. Allicin can help fight bacteria and parasites, according to an article published in the scientific journal "Microbes and Infection." But other compounds, like tomatoes' cancer-fighting lycopene, become more available through cooking. Columbia Health Go Ask Alice! 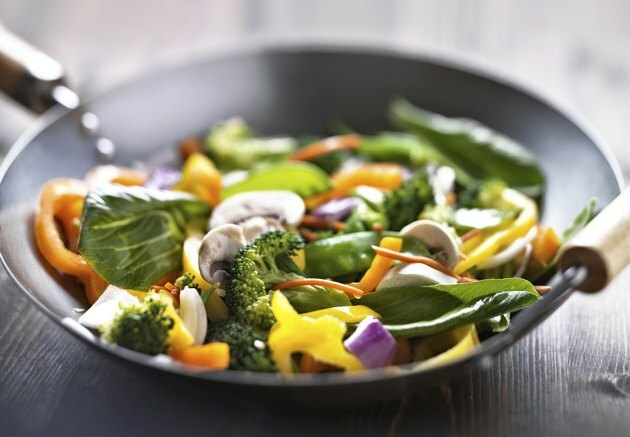 : Cooking Veggies and Vitamin Loss? Health Magazine: Raw or Cooked: Which Vegetables Are Healthier?